Union Public Service Commission is one the organization in India. It releases notifications for Gazette and non-gazette posts. Up to now it has released many vacancies in all departments. It releases notification for civil services, combined defence academy, naval academy examinations, Indian economic service, etc. Lakhs of applicants will register their name for every notification. The selection process of UPSC Engineering Service Exam 2017 is conducted in three stages. In first stage they will conduct prelims exam, and in second stage they conduct mains exam. The third stage is personality test. UPSC is one of the highest competitive exams in India. So they are implementing filtering process. Applicants to get the job they must have to qualify all rounds. You can find all UPSC ESE latest updates on our website. Online applications are already started on Sept 28th and the last date to submit application is October 26th, 2016. 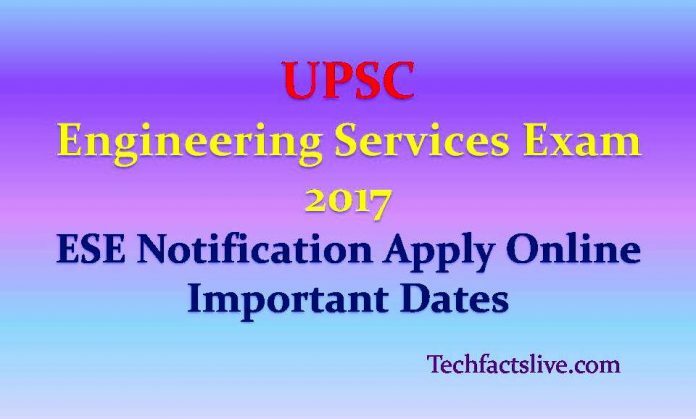 For more details, please check out the notification of UPSC Engineering Service Exam 2016 at official portal @upsc.gov.in.